Wandering around New York, when I was there last year, and walking through Central Park I found myself in the Upper East Side, one of the most exclusive neighborhoods in Manhattan, and recalled the wonderful brownstone town house that was owned by the late Dr. Murray Banks, who happened to be one of the most sought after speakers in America during the 1950s and 1960s. The house on 62nd.St. Upper East Side was beautiful both inside and out. The furnishings, were antique with a few modern pieces. It had the most fantastic staircase that was made with balusters of Antique Venetian glass walking sticks. I have never seen anything quite like it. Not my taste, but quite stunning. The man was a millionaire with an odd quirk, as we were soon to find out as we got to know him. He was mean, generous in many ways, but as far as money went “as tight as a ducks arse in water!” Maybe that’s how he became a millionaire, who knows? But I go ahead of myself. How Ray and I first met him is rather strange. It was in London in the early 60s. A friend who knew Dr.Banks well invited us to one of the lectures that he was giving at Woolwich Town Hall, which had a very large auditorium. Both Ray and I were really not into lectures per se, but our friend convinced us that we had never heard a lecture like one from Dr. Murray Banks, and he was right. It was laughter all the way. Before the lecture we were introduced to Dr. Murray Banks, a rather short, stocky man, with a wonderful welcoming smile, and a very strong Jewish Brooklyn accent. He had a rather ill-fitting toupee that seemed to have a life of its own. He was standing by a table surrounded by dozens and dozens of books and records, all for sale (of course!). After introductions he grabbed me and said, “Hey Eric, when I ask for questions from the audience, I want you to ask me, ‘Doctor, what do I do for a persistent cough?’” So of course I agreed. Murray looked up at me and said slowly, “You ask, young man, my remedy for a persistent cough? ” He paused, then said. “Take plenty of laxatives, and then you’ll be too scared to cough!” The audience was in hysterics and that is the way the rest of his lecture continued. 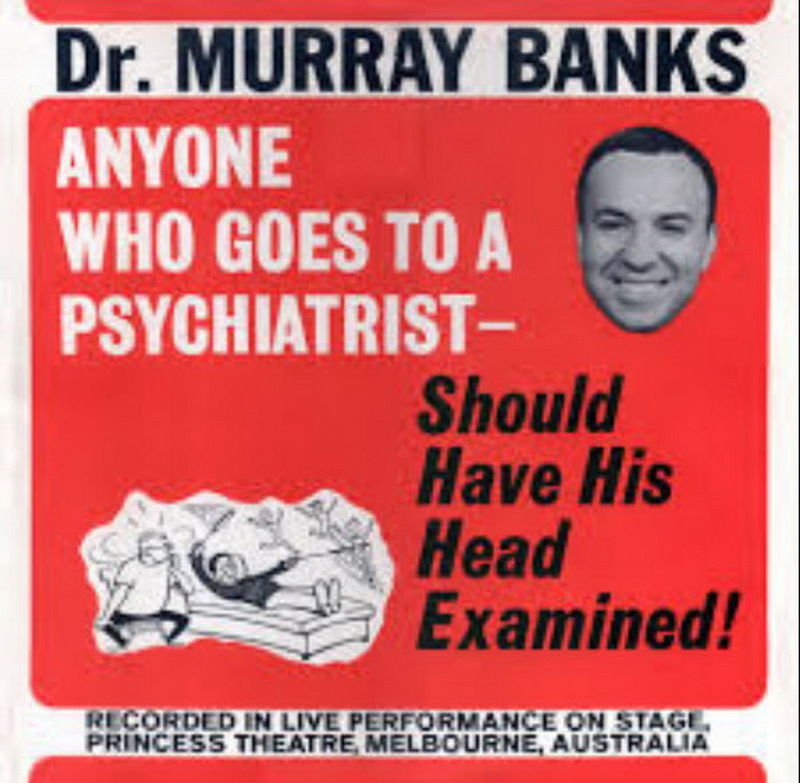 For a psychologist he was a brilliant comic. He knew the way the mind worked, after all he was a Psychologist! He was on the ball the whole time. After the show we went downstairs by the entrance where Murray had his table full of wares and he was surrounded by people buying books, records, autographs, etc., and the money was changing hands fast. Straight into his pocket. 62nd.St.In fact they laid the table bare. We asked him whether he would like to go out for dinner, but he said that he was tired and just wanted to go back to the Cumberland Hotel at Marble Arch where he was staying. I thought maybe he wanted to go back to count his money! So we gave him a lift in the Rolls. He had no luggage, he’d sold everything! As he was staying in London for a few days before he did his lecture tour around the whole of England, we arranged to take him for dinner to April Ashley’s Restaurant, April and Desmond’s the following night. We collected Murray at 8p.m. and drove to Knightsbridge. He was intrigued with April and thought she was so beautiful. He was ‘au fait’ with her past history and told us that he was very friendly in the States with Christine Jorgensen, who was the first Trans Gender American, whom he had given counseling to many times. Well, we had a fine old time. Unfortunately Murray didn’t drink, only cordial (ugh! ), but Ray and I made up for that! After a very enjoyable evening we took him back to the Cumberland Hotel and left him with the promise that the next time we were in New York we would see him there. As it turned out he came back to London for a few days at the end of his tour and this time we took him to ‘Joe Allen’s’, which he also knew from New York. A normal evening at Joe Allen’s in London. The next time that Ray and I were in New York we rang Murray and he invited us over to his house, which I have already described. For someone with such exquisite taste, he dressed so badly, but that was none of our business. He offered us a drink of either cordial or Coca Cola or coffee. There was no alcohol in the house. So we settled for a coffee, which he got someone else to make. Later we all went off to Ted Hook’s Restaurant called ‘Backstage’ a great fun place, for dinner, our treat. Murray stuck to his cordial, but he was still great fun. As we were only in New York for a short time and Murray was busy for a week with lectures, it was left that he would take us to his favorite Chinese restaurant in China Town the next time we were in New York. Two months later we were back in New York and Murray collected us from the Waldorf Astoria in his chauffeur driven limousine and we were off to China Town. The limousine stopped at the tattiest looking restaurant on the block. The owner greeted Murray as a regular and we were ushered to a table with a torn table cloth. Murray told us that the restaurant didn’t serve drinks, ( if we would have known, we could have brought a bottle), so Murray ordered 3 glasses of water, which came three quarters filled (they knew Murray from old). He then took out of a carrier bag a baster which one usually uses for the turkey. This time it was filled with cordial and he preceded to fill up our glasses. I didn’t dare look at Ray and he didn’t look at me. It took us both all our effort to keep a straight face. Meanwhile Murray didn’t turn a hair, and just behaved as though it was his norm. Well it certainly wasn’t ours, and the meal really was awful! Next time we knew not to accept a dinner invitation from Murray. Still it was his only quirk and I have never met a psychologist, or psychiatrist, or psychoanalyst who was normal. He told us that he would be away lecturing on a world cruise, so he was renting the house to Judy Garland as she was appearing in New York. It all sounded very jolly. Judy Garland! My, oh, my! Next time Ray and I were in New York we rang Murray to invite him out for dinner, we weren’t going to chance an invite from him again! But he declined and told us to come over to the house instead, as he’d just returned from another world cruise lecture. When he answered the door he seemed very down, and when we asked him why, he just pointed round the room and said, “Look!” More than half of the antique Venetian glass walking sticks on the staircase were smashed. Apparently Madame (Judy) or the children, in a fit of pique had taken a stick and smashed them. He said that there was more damage upstairs, which we didn’t see, as we had never been upstairs. Litigation was in process. Her cheques had bounced. Poor Murray! and also poor Judy! it seemed that his rental to Judy Garland had been a very unprofitable, dead loss. The last time we saw Murray was when Zee and Co. was staring at the Sheraton Bal Harbor Hotel in Miami and we went to see him at Fort Lauderdale where he was getting ready for another cruise lecture. I have downloaded 3 L.P.s from YouTube of Murray Banks for you to listen to. I’m sure you will agree with me that he was a wonderful comic with an ingenious mind. 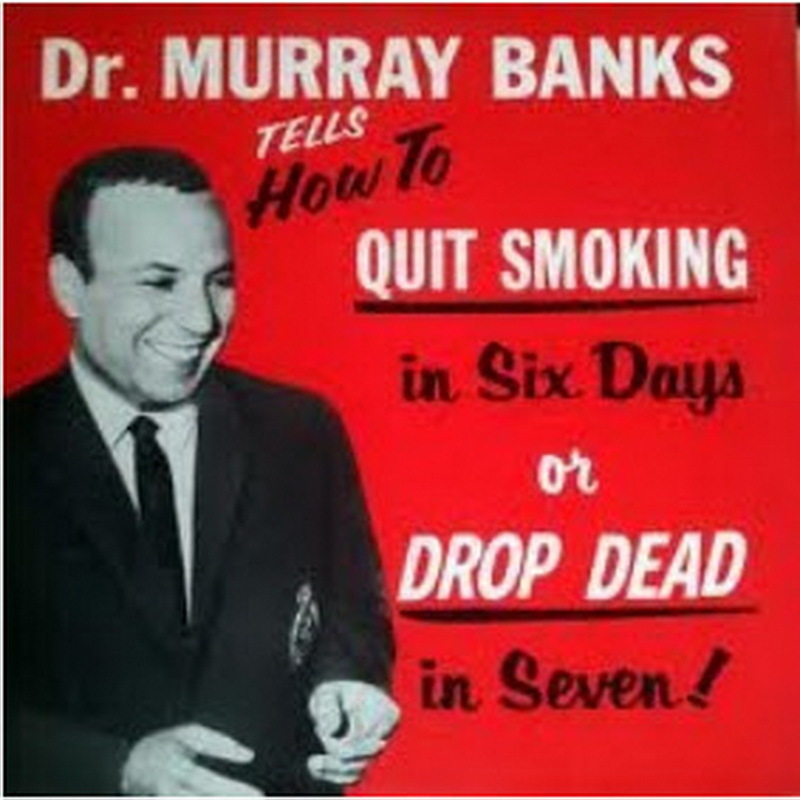 How To Quit Smoking In Six Days Or Drop Dead In Seven! Posted by scorpio13th on March 2, 2016 in April and Desmond's Restauranr "AD8", April Ashley, Christine Jorgenson, Dr. Murray Banks, Eric Lindsay, Joe Allen's, Judy Garland, Ray Jackson, Ted Hook's "Backstage"